The Bible Museum is dedicated to the history and narrative of the Bible, located near the National Mall in Washington DC. 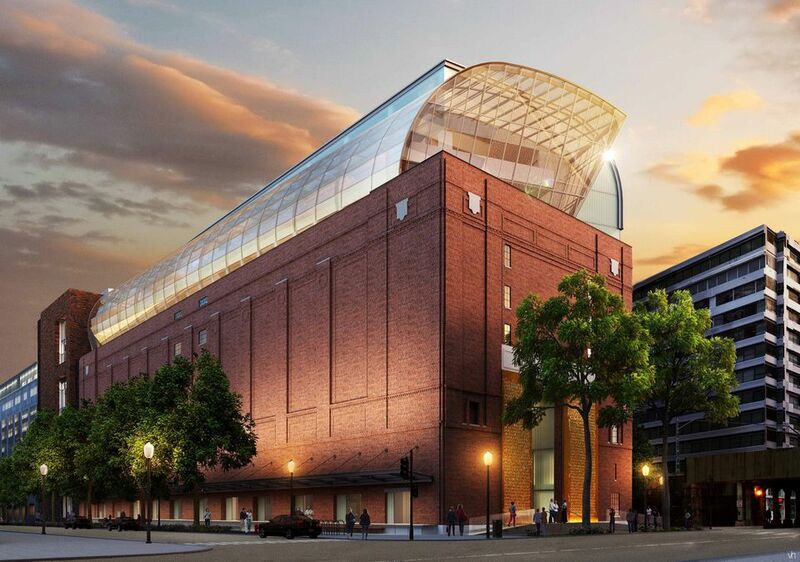 The Museum of the Bible, a 430,000-square-foot, eight-story cultural institution was financed by Steve and Jackie Green, owners of the arts and crafts store chain Hobby Lobby to house their private collection of more than 40,000 rare biblical texts and artifacts. The museum is designed to invite people of all ages and faiths to engage with the Bible via a scholarly and engaging presentation including a series of high-tech exhibits and interactive experiences. The museum opened November 17, 2017, and is located three blocks from the ​U.S. Capitol. The Museum of the Bible includes a state-of-the-art lecture hall, a lobby with floor-to-ceiling interactive media wall, a performing arts theatre, a children’s area, restaurants, and a rooftop garden with panoramic views of Washington DC. Distinct long-term and short-term exhibit spaces will showcase treasures of the Bible from other leading museums and collections worldwide. Artifacts from the collection have been on display via traveling exhibits in Oklahoma City, Atlanta, Charlotte, Colorado Springs, Springfield (MO), Vatican City, Jerusalem, and Cuba. Explore the Bible's impact on world culture and modern-day civilization—from literature and fine arts to architecture, education, and science; on film, music, and family; and government, law, human rights and social justice. Discover archaeological and historic treasures, like the Dead Sea Scrolls, ancient Torah scrolls, early New Testament texts, rare biblical manuscripts, incunables and first-edition Bibles. Walk through a replica of first-century Nazareth, the town that Jesus knew. Witness the preservation, translation, and transmission of the Bible over time, from clay tablets revealing the earliest writings to today’s digital Bible. "Drive Through History" on a high-definition sensory ride offering dynamic encounters with great people, places, and events that changed the world. Location: 300 D St SW, Washington, DC, the former location of the Washington Design Center. The closest metro station is Federal Center SW. The building’s 1923 original red-brick masonry, classical features and exterior ornamentation was restored to its original condition. The general contractor was Clark Construction, the group behind the recent White House Visitor’s Center renovation and the new construction of the Smithsonian National Museum of African American History and Culture. The building, originally constructed in the 1920s as a refrigeration warehouse, was restored, adapted, and enhanced with architectural plans by Smith Group JJR, the architectural firm that designed the International Spy Museum, the White House Visitor Center, Normandy American Cemetery Visitor Center, and are currently working on the Smithsonian's National Museum of the African American History and Culture. Other architects and design firms involved with the museum project include The PRD Group (Smithsonian National Museum of American History, United States Botanic Garden ), C&G Partners (U.S. Holocaust Memorial Museum, Metropolitan Museum of Art) and BRC Imagination Arts (Abraham Lincoln Presidential Library and Museum, Disney’s Hollywood Studios Orlando). A team of scholars, writers, and museum experts also assembled artifacts and developing content to appear in the museum’s primary exhibits. Visiting the Holocaust Memorial Museum in D.C.